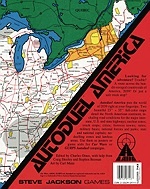 Making your way in the post-apocalyptic world of Car Wars is tough to do; with the the Autoduel America Map, it just got a little easier. Newly released to e23, this supplement details the cities and routes of the world of tomorrow, including information on travel conditions, and whether those roadways are patrolled or lawless. It also includes data on the various regions of tomorrow; learn where there are lawless areas, non-duelling zones, commercial combat zones, and more. Do you feel driven to put your name on the map? Do you feel like you've lost your way? Then you need the Autoduel America Map!